This digital oscilloscope is great for carrying out signal measurements where it simply isn't possible to bring the signal input near to a bench oscilloscope. 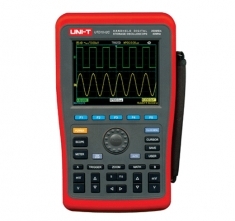 A portable, lightweight and handheld unit, the UTD1042C is a dual-channel digital oscilloscope that can be used to measure signals with bandwidth of up to 40MHz. Since it is dual channel the device can display both signals at the same time, with each waveform represented by a different colour on the devices' high quality built-in colour screen. The oscilloscope mode of this device includes 250MS/s sampling rate, rise time of ≤8.7ns, memory depth of 7.5kpts, vertical sensitivity of 5mV-50v/div, time-based range of 5ns-50s/div, multiple storage modes (bitmap, waveform and setup), multiple trigger modes (edge, pulse, video and alternate) and also includes a USB port for sending data directly to PC. 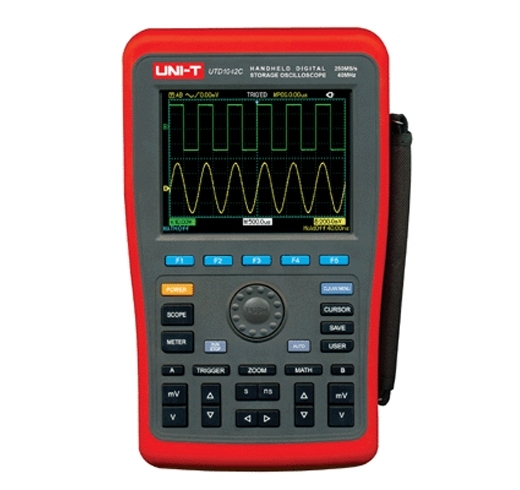 In addition to carrying out oscilloscope functions the UTD1042C also includes a full 6000 count digital multimeter. This mode can be used to carry out measurements of DC voltage from 600mV to 1000V, AC voltage (45Hz-400Hz) from 600mV to 700V, DC current from 6mA to 6A, AC current from 6mA to 6A, resistance from 6KΩ to 60MΩ and capacitance from 6nF to 600μF. This handheld oscilloscope is CAT II 300V and CAT III 600V safety rated.